In July, we visited a butterfly garden at the Minnesota Zoo, and we were able to see many gorgeous butterflies and chrysalises. 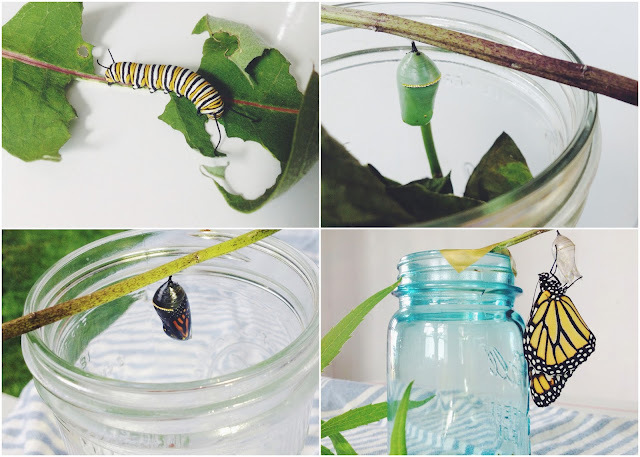 It was an amazing sight, but nothing was quite like watching a caterpillar turn into a butterfly in my own kitchen. Having a front-row seat to the little miracle was nothing short of amazing, and I am so happy that Nolan got to see it all too! It all started with my friend Sue. She is a first-grade teacher, and she collects caterpillars every year in late August for her classroom. 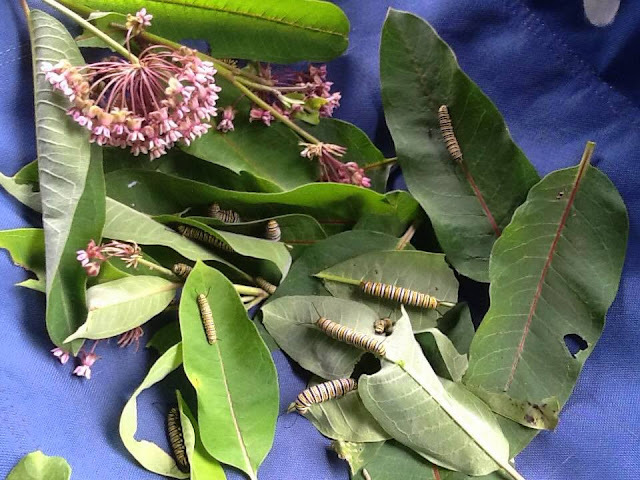 These monarch caterpillars were found grazing on milkweed on the mountain where Sue lives. She brought her collection of chrysalises to church with her a couple of weeks ago, and there was one little caterpillar who had not changed yet. She offered him to me, and I eagerly accepted the little guy. I carried him home on a leaf, and set him up in a Mason jar with breathable cheesecloth rubberbanded around the top. He was a VERY hungry caterpillar. He ate and ate and ate. I went for a drive and found him some more milkweed. I laid a milkweed stick over the top of the jar. The next day, he had stopped eating, and we could tell he was searching for a spot to start his big transformation. The next morning, he was hanging down in the shape of a J (I didn't get a photo of this since the stage didn't last long.) We looked at him again about a half hour later, and he was a beautiful green chrysalis! Above, you can spot the caterpillar skin that he shed in order to become the chrysalis. After ten days of sitting on the kitchen counter, we could tell the chrysalis was starting to change. A few black lines were visible underneath. His wings were small and damp. After a few minutes, the wings had stretched to nearly their full size. He hung from the empty chrysalis until about 3:30 while his wings dried. I was a little nervous to hold him, since I didn't know if he was quite ready to be touched. Steve picked him up first, and then he transferred the butterfly to me. Such a cool experience to hold him! After a few minutes, he had the courage to fly, and he flitted around our yard. He landed on our neighbor's shed for about a half hour, and then he was gone the next time I checked. Caterpillars only have something like a 20% survival rate since they have so many predators. Monarchs are very close to being endangered (read this Washington Post article to hear more about that.) Bringing them in the house at least guarantees their survival as chrysalises. UPDATE: I just found out that after all the male pronouns I used in this post, my butterfly was actually a GIRL! The males have two distinctive black dots on the lower parts of their wings, and their black veins are very thin. :) SHE was a very beautiful butterfly! What an amazing experience! My daughter would love it, she is always in the hunt for caterpillars. How cool! Thank you for sharing your photos! What a wonderful post, detailing the transition/growth from caterpillar to butterfly! And what a testament to God, in His creation of these beautiful beings. So glad you and your family could witness this evEnt. Great pictures! So beautiful! What an amazing thing to witness!! Wow, that would be awesome! Thank you for sharing the beautiful photos! First, I love that the butterfly was a girl and you could tell! Second, that's the neatest thing that you can see through the chrysalis right before the butterfly emerges! God makes the most beautiful things, doesn't He?! In first grade my teacher hung chrysalises up all around the classroom and we got to experience this! That's so cool! I'm afraid of all crawly things....so while I can admire a gorgeous butterfly from a distance, if they get too close I will run! haha. I don't want anything landing on me! That is so cool! I love all the pictures!